Mónica Rivera nació en Puerto Rico en 1972. Obtuvo el título de Bellas Artes en 1993 y el de Arquitectura en 1994 por la Rhode Island School of Design, EE.UU. (Beca RISD). En 1999 obtuvo el Master de Arquitectura (M.Arch II) por la Harvard University Graduate School of Design (Beca GSD). Trabajó tres años en el despacho Architecture Resesarch Office (ARO) en Nueva York. En Barcelona, donde vive desde el 1999, trabajó para la Editorial Gustavo Gili de 2000-2004. 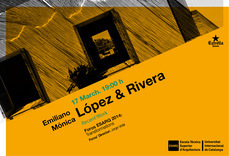 Ha sido profesora invitada de Arquitectura en la ESARQ, Universitat Internacional de Catalunya entre 1999-2002 y profesora del tercer año de proyectos de diseño interior y espacio doméstico en Elisava Escola Superior de Disseny, Barcelona, entre 2001-2008. Mónica Rivera was born in Puerto Rico in 1972. She received a Bachelor of Fine Arts in 1993 and a Bachelor of Architecture in 1994 from the Rhode Island School of Design (RISD Scholarship). In 1999 she received a Master of Architecture from Harvard University's Graduate School of Design (GSD Scholarship). 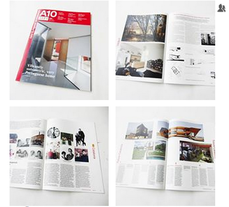 She worked for the firm Architecture Research Office (ARO) in New York for three years. In Barcelona, where she has been living since 1999, she worked for the Editorial Gustavo Gili from 2000 to 2004. She has been a guest professor of architecture at the ESARQ, Universitat Internacional de Catalunya from 1999 to 2002 and Professor of third year Interior Design Studio focusing on domestic space at Elisava Escola de Disseny, Barcelona from 2001 to 2008. Emiliano López Matas was born in Argentina in 1971 and grew up in Barcelona. In 2012 he received his Doctoral degree in Architecture from the Universitat Politèctina de Catalunya, with the thesis titled ‘6107 MSD. Peabody Terrace: Keys of a design process led by Josep Lluís Sert’. In 1999 he received a Master of Architecture degree from Harvard University's Graduate School of Design (Real Colegio Complutense de Madrid Scholarship) and in 1997 he received the Master "History: Art, City and Architecture" from the UPC, ETSA Barcelona. He received his degree in Architecture from the Universitat Politècnica de Catalunya, Vallès in 1996. He has taught at the Univesitat Rovira i Virgili School of Architecture, Reus, at the ESARQ, Universitat Internacional de Catalunya, Elisava Escola de Disseny and from 2004 to 2007 as Adjunct Assistant Professor of Calgary University, he co-directed the school's Barcelona Architecture Program. He is currently professor of architecture at the UPC, Vallès. La revista holandesa A10, de intención europea y alcance internacional, presenta en su número de marzo/abril de 2014 una apuesta por trece estudios profesionales radicados en Cataluña junto a un extenso e intenso análisis de contexto. 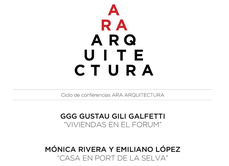 Dentro del ciclo “Foros Esarq 2014: Transformaciones”, López y Rivera presentan “Obra Reciente” y revelan su filosofía para convertir las restricciones en oportunidades.